Why are the Southern California seas turning bright green? 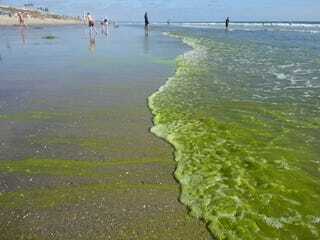 When you see green waves like this washing up on shore, probably your first thought is: Toxins! Luckily, in the case of this beach near San Diego, this bizarre coloration comes from something harmless. There's a bright green algae bloom making the waves look like they've been highlighted with a fluorescent marker. The color is caused by an algae bloom dominated by Tetraselmis, a harmless single-celled flagellate.